The recipes in this 21 Day Fix Dinner Ideas post was specifically put together not just to feed one person following the program, but to be creative enough to feed the entire family. Plain and simple, the 21 Day Fix is a whole foods-based diet that consists of lean proteins, whole grain carbs, fruits, vegetables, and healthy fats. The great part of letting go of overly processed foods is you can create easy-to-make meals with a few simple ingredients, spices or dressings that are not just flavorful, they’re much less forgiving to your waistline. You have plenty of leeway with these ideas. They are meant for you to be able to make your own personal adjustments to them. They are also quick and simple, so feel free to add extra spices where you see fit. Most recipes you can add an extra side vegetable (green container) or serve with a carbohydrate (yellow container). The serving sizes are another easy area to adjust. Some of the recipes call for potato, which you can usually use 1 or 2 servings of and the same is true for the red container proteins. Basically, it is up to you how large you make each serving. 1. Salmon Asparagus Wrapped in Tinfoil. Place 10 spears of asparagus on a piece of tinfoil. Place 1-2 portions of salmon on the asparagus, top with a couple slices of lemon, 1tsp olive oil, and pepper to taste. Fold the tinfoil into a pouch, bake in a 425°F preheated oven for 20-25 minutes or until cooked through. Serve on one yellow container of wild rice or other favorite grain. 1 green, 1-2 red (depending on the amount of salmon), 1 tsp, 1 yellow. 2. Easy Baked Caprese Chicken. In a 9×12 pan, place chicken breasts, season with pepper. Drizzle 1tsp of olive oil over each breast and top each one with 1 green container of sliced roma tomatoes, basil, and one blue container of mozzarella cheese. Bake at 350°F for 30-40 minutes or until chicken is cooked through and cheese is melted. Quinoa makes a great side. Each serving is 1-2 red, 1 green, 1 tsp, 1 blue. 3. Chicken & Potatoes in Foil. For each foil packet, place cubed potato on bottom, then place chicken breast on top of potato, top with 1tsp olive oil, pepper to taste, add a little fresh squeezed lemon juice or lemon slices. Fold the foil over and bake at 400°F for about 25 minutes or until chicken is cooked through. 1 yellow, 1 red, 1 tsp. 4. Coconut & Shrimp Soup. In a blender, mix a green container of spinach with canned coconut milk. Separately, sauté 1/2lb shrimp in 2tsp olive oil, then add spinach coconut purée. Once the soup has boiled, it is done. You can also add hot sauce or curry powder, diced vegetables, and even mussels or clams. Base recipe contains green, red, blue, and tsp containers. 5. Baked Steak, Peppers, & Onions. This one you can bake, or you can chop everything up and then cook on the stovetop like a stir-fry. Place lean cuts of steak in aluminum foil-lined casserole dish, top with 1tsp olive oil, pepper to taste, 1 chopped garlic clove, slices of green peppers, red peppers and onions (use as many as you like!) Cover with aluminum foil, bake at 350°F for a half hour. Uncover and bake for an additional 30-45 minutes depending upon the steak thickness. This recipe uses red and green containers, plus tsps. Slice the steak and serve on heated corn tortillas if you like, and count it as 1 yellow. 6. Ground Buffalo & Zucchini Helper. We got this idea from a buffalo chili recipe we tried last month. Heat 2 tsp olive oil in a cast iron skillet. Add 2 cloves chopped garlic and brown the ground buffalo/bison. When meat is browned, add 2 diced tomatoes, and 1 diced habanero pepper. Simmer until the tomatoes become soft, and then add chopped zucchini. Cook over low heat until the zucchini is tender about 15 minutes. Each serving should be about 1 red container, 1/2 tsp, and a green. Adding 1T chili powder and 1tsp cumin to add a Mexican flavor flare. 7. Ground Turkey & Cabbage. Heat 2tsp olive oil over medium-high heat, add 1lb ground turkey, pepper to taste, 1/2 head chopped cabbage, 1 diced onion and 2 cloves chopped garlic.Cook over medium heat until the turkey is cooked through and the cabbage is soft. You can also add diced tomato near the end to keep it a bit moister. This goes great over a bed of wild rice. Each serving should be about 1 red container, 1/2 tsp and 1 green depending upon the amount of cabbage you use. 8. Avocado & Turkey Burgers. Spray a skillet or griddle with non-stick cooking spray. Combine 1lb ground turkey with 1 mashed avocado and pepper to taste. Form into 4 equal patties and cook through, about 5 minutes per side. Each patty serving should be about 1 red and 1 blue. You could serve these on a folded over piece of whole-grain bread (1 yellow) or serve homemade & healthy french fries on the side. 9. Haddock with Tomatoes. Cut 1 haddock fillet into equal-sized pieces and place in casserole dish. Top each piece with 1tsp oil, pepper to taste. Add fresh-squeezed lemon juice or slices of lemon to each piece. Cook at 375°F for about 15 minutes. Then, place diced tomatoes on each piece and cook for an additional 15 minutes or until haddock is cooked through. Each serving should about a 1 red, 1 tsp, and 1 green. 10. Sweet Potato Stuffed with Black Beans. Bake 4 sweet potatoes at 400°F for about one hour. Drain one 16-ounce can of black beans. When potato is cooked through, cut each in half length-wise, and scoop a little sweet potato out to make room. Fill each cavity with equal amounts of black beans. Return to oven until heated through about 7 minutes. You can also mix other veggies in with the black beans. Each serving would be 2 yellow, unless you are vegetarian, then 1 yellow could be counted as 1 red. 12. Ground Chicken Zucchini Boats. Brown 1lb ground chicken. When almost cooked through, add 3 diced tomatoes, 1 clove chopped garlic. Cook until tomatoes are soft, and then set aside. Slice each of 2 zucchini in half, removing seeds. Place equal amounts ground meat mixture into each half, top each with 1 blue container of mozzarella cheese, bake in a tinfoil covered casserole dish at 400°F for about 30 minutes or until zucchini is tender. Each serving should come out to about 2 greens, 1 red, and 1 blue. 13. Cod & Tomatoes in a Foil Packet. Cut a cod fillet into equal one size serving pieces. Arrange each piece on tinfoil. Drizzle 1tsp olive oil onto each, place 1 green container of cherry tomatoes, 1 clove chopped garlic, pepper to taste, and a couple pieces of fresh basil to each. Fold over to create a packet, and bake at 400°F for about 25 minutes depending upon the thickness of your fish and making sure it is cooked through. 1 tsp, 1 green and 1 red. 14. Grilled Mozzarella-Stuffed Buffalo Chicken. Butterfly cut two chicken breasts. Pepper the insides. Place one blue container of mozzarella cheese into each breast and fold the top of the breast over. Coat one side with your favorite Mexican hot sauce. Place coated side down on medium-high heat grill and cook 8 minutes. Coat the other side with with hot sauce, flip, and grill an additional 7 minutes or until chicken is heated through and cheese is melted. You can also add additional hot sauce to the side that was grilled first for some extra bite. Serve along with carrots and celery. This recipe will use 1 red, 1 blue container, and 1 green container if you serve with veggies. 15. Whole Baked Chicken with Root Vegetables. Chop carrots, potatoes, sweet potato, celery, onion, 2 cloves chopped garlic and place them at bottom of a roasting pan. Add 1T olive oil and pepper to vegetables and mix. Quarter a lemon, and place lemon inside the cavity of a roasting chicken, drizzle with olive oil and your favorite spices (I like garlic powder and pepper with a dash pink Himalayan sea salt). Cover and bake at 450°F for 45 minutes. Remove from oven, stir the vegetables, and return to oven. Reduce temperature to 375°F for an additional 45 minutes or until the internal temperature of the chicken reaches 160°F. Depending on the ingredients you use, this recipe will get you plenty of red, green, and yellow that you can enjoy for a few meals. 16. Shrimp and Corn Bake. For each pound of shrimp, create 4 tinfoil pockets, placing equal amounts of shrimp into each piece of tinfoil. Quarter each piece of corn and add to foil packet. Coat each packet with pepper to taste and 1tsp of olive oil. Close packet and place in 350°F preheated oven, cook 15-20 minutes or until shrimp is cooked. You can also add chopped potato to each packet, and the 21 Day Fix Southwestern spice mix works well in this. The recipe makes uses 1 tsp, 1 red and 1 yellow and goes great with steamed asparagus. 17. Baked Basil Stuffed Chicken Breasts. Butterfly slice each chicken breast. Pepper the inside of each, add a layer of fresh basil leaves, a layer of sliced red pepper, and top with a blue container of mozzarella cheese. Fold tinfoil over, secure with tooth pics if needed. Place on oiled cooking sheet and bake at 400 degrees or until chicken is cooked through. Each serving should be a red, green, and blue container. This meals goes great with roasted red potatoes. 18. Chicken & Veggie Bake. Place each chicken breast in the center of a casserole dish, leaving a couple inches in between. Place chopped potatoes up and a selection of your favorite veggies around the chicken breasts. Top with 1 tsp of olive oil for each chicken breast. Add pepper and a little garlic powder to taste. Cover with aluminum foil and bake at 375°F for about 1 hour or until veggies are soft and chicken is cooked through. Lots of green and red containers in this one, plus 1 tsp. 19. Spicy Lime Salmon. Mix 2T of your favorite Mexican hot sauce with the juice of one lime and little pepper to taste. Slice salmon into equal sized portions, place on foil-lined baking sheet, and cook in 400°F preheated oven for 17 minutes or until salmon flakes with a fork. Serve with roasted potatoes, wild rice or grain and veggie of your choice. Each serving of salmon is 1 red container. 20. Quick Steak & Onions. You can use a lean cut of steak cut into strips or even venison as an alternative for this recipe. Heat 2tsp olive oil in a cast iron skillet to medium high. Add sliced meat to skillet, cook 30 seconds or until browned, flip, and then cook another 30 seconds, sprinkling with pepper and garlic powder to taste. Lower heat to medium and add in sliced onion to skillet. Continue to cook until the onion softens and steak is cooked to your liking. Serve over whole grain rice. This recipe uses 1 red, 1 tsp, and 1 green container. When I first saw the 21 Day Fix diet, I honestly thought it was going to be pretty boring. Meat with seasoning, plain grains, and steamed vegetables was pretty much all I ate to in the beginning. But since my original review of the 21 Day Fix program, I feel like I have learned so much about nutrition. What the 21 Day Fix diet has taught me is that a whole foods-based diet does not have to be a boring and flavorless diet. Everyone’s taste buds are different. I left these recipes pretty light spice-wise to give you freedom of spice. Try experimenting with different spices and use the season mixes from the 21 Day Fix eating plan to liven up your meals. 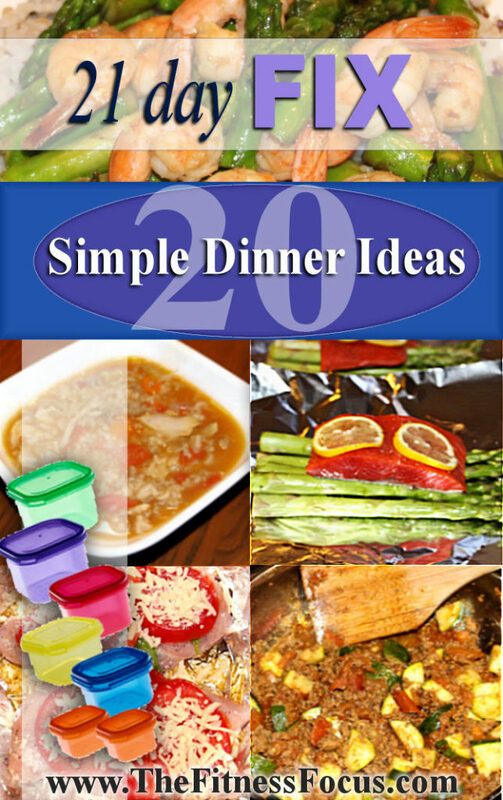 Take advantage of single-pot meal recipes! They save on cooking time, and make cleaning the dishes so much easier. Make tinfoil your best friend, because foil packets are a great way to steam foods in the oven. Also line baking sheets and casserole dishes with tinfoil to make clean-up a whole lot easier. I hope this blog post has given you at least a few 21 Day Fix ideas that you can use to serve not only you, but your entire family, a healthy, wholesome and tasty dinner. If you have any of your own recipes or tips to making 21 Day Fix approved dinners, please leave a comment below in the comment section. I love the recipes and lost close to 30 lbs. on the 21 day fix 2 and a half years ago after about 6 months on the plan and have kept most of it off with the 21 day “maintenance” plan according to my weight, etc. I recently gained back about 7 to 8 lbs. over the course of a few months and have gone back on the fix to lose weigh. If I remember correctly, many of the recipes in the 21 day fix cookbook (which I lost in the house somewhere!!) as well as ones that our coach gave us didn’t include much beef unless it was super lean (which is way expensive here in NY!!) since some beef has a very high saturated fat content so I did give up beef back then, and I don’t eat bison, venison or buffalo, lol. I do eat chicken, fish and turkey. I’ve found that ground turkey is a wonderful replacement for ground beef as well. But I do love the whole 21 Day Fix program!! It works! I was looking for a shopping list? I love your easy recipes! Thank you SO MUCH. I was getting sick of my diet, because I was sick of thinking of things to cook. I will spread the site. Hi. Thank you for this information. I appreciate it as I was extremely confused. I have a couple of questions. Is wild rice or whole wheat rice the only type of rice one can use? I do love quinoa. Can I use couscous, basmati or jasmine rice or no? Lastly, when measuring everything in for example, the red and green containers, do I measure it before or after I cook everything? seems to me that afterwards would be easier since any shrinkage of meats will have taken place in the cooking process and the measurements would be more accurate. What do you think? Thanks again for these recipes. I enjoyed reading this and it has made me feel more excited about starting the program. My biggest problem is that I’m a picky eater due to sensory sensitivities. Some foods that I should eat literally make me gag or vomit (sorry for TMI). Because of this, I don’t eat (or come around) fish and almost all cooked veggies. I’m worried that I’ll get bored with what I CAN/will eat. And, to top it all off, I have acid reflux issues (triggered by foods I WOULD eat – onions, peppers). Ahhhhhh! So… I’m probably going to have trouble meeting my daily goal for veggies and proteins. I’m not very adventurous in the kitchen. Oh, and here’s a side note – I’m allergic to oats! Can I substitute beef or chicken for fish recipes? I’m worried that what I cook will be bland or whatever in some way. Any advice or suggestions would be greatly appreciated! Hi Andrea, For sure you can make substitutions. Salt free seasonings are a great way to add flavor to your meals without adding sodium. I hear you about not liking many veggies, I used to be the same way. What I found was roasting in the oven or sauteing veggies in olive oil make a lot veggies I used to not like much more palatable. Quick question–for example the ground turkey and cabbage, how much is one serving? I can measure out the rice because it is separate, but for the turkey and cabbage do you just eyeball a red and a green? If my question doesn’t make sense just let me know, haha. Hi Bethany, whats the total cost of the 21 day fix? what does it come with.. does reciepes come with it? videos? weights? Thank you..
Best meal ideas I have seen on pintrest! Thank you!! Hi Renee! You’re welcome, thanks for stopping by! Love this site, but what is the green, red and yellow you refer to.? Hi Char, The colors are the containers from the 21 Day Fix diet program. Here is a link to my full review of the program. This was a great post! Love all your ideas for meals. You just took the “hard” out of this program. So nice to have a go to list to make dinners on this program. Thank you!! !